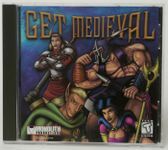 Get Medieval is an action video game developed and published by Monolith Productions for the PC. It was released in North America on August 22, 1998. Get Medieval is an overhead shooter in which the player can control one of four characters in a dungeon, players can find Attack and Defense Upgrades, once you die you lose these upgrades. Also it can be played in 3 modes, Dragon Quest, Random Dungeon, or Custom Dungeon, and 4 difficulties Easy, Medium, Hard, Torture Chamber, it has 40 levels, and 20 types of enemies. This gameplay is almost identical to that of Atari's arcade game Gauntlet. Source: Wikipedia, "Get Medieval", available under the CC-BY-SA License.